A writer who has lived in Scotland for many years chronicles her return to her birthplace to explore the idea and reality of boundaries between nations. Poet and memoirist Kassabova (Twelve Minutes of Love: A Tango Story, 2013, etc.) 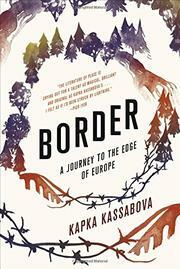 left Bulgaria with her family when she was a child, eventually settling in the U.K. She returned to the Balkans, where “Bulgaria, Greece, and Turkey converge and diverge,” to explore tiny, almost-abandoned mountain villages and border points where, in the communist era of her childhood, those who attempted to cross in either direction might be killed. She found a new group of immigrants, from Syria, in the region, trying to get to Greece or Bulgaria but stuck either in camps or trying to make a living as individuals in Turkey. This is far from a conventional travel narrative. The book is as much about Kassabova’s emotions and misgivings as the world of the senses, with digressions about dragons, magical springs, ghosts, and the evil eye. A woman traveling by herself in a part of the world where doing so opens her to being perceived as a prostitute, the author met and talked to men while the women stayed hidden. These men, whose real names she alters, are shepherds, ex-spies, Eastern Orthodox priests, smugglers, and former border guards. They told her long, complicated, and possibly true stories. She suspected two, probably drug dealers, of kidnapping her and fled in terror to the safety of three strangers living in “a paradise of lemon balm and fig trees.” Telling her story, she includes bits of the layered history of the region, not so systematically that an outsider can piece it all into a coherent narrative but nonetheless studded with flashes of insight. A dreamlike account that subtly draws readers into the author’s ambivalent experience of a homeland that has changed almost beyond recognition.